Racial slurs were written on the dormitory message boards of five black cadet candidates at the Air Force Academy Preparatory School earlier this week. Lt. Col. Allen Herritage, director of public affairs for the academy, said the slurs were discovered Monday. One cadet candidate’s mother posted a photo on her Facebook page Wednesday that shows the words “go home n*****r” written on the white board outside her son’s room. His father also said he felt the academy was taking the right steps to handle the incident ― though he lamented that it will inevitably turn into a big deal ― and that it doesn’t reflect on the academy and its staff as a whole. Air Force Times is not identifying the cadet candidate or his parents to preserve their privacy. In a statement issued Thursday, Lt. Gen. Jay Silveria, the academys new superintendent, condemned the slurs. Herritage said Silveria planned to address the incident in a meeting with the Prepatory School and Cadet Wing students Thursday. Herritage said that the academys security forces are investigating the incident, but that no additional information can be released at this time. Democratic Rep. Adam Smith, D-Washington, the House Armed Services Committee’s ranking member, urged swift action. The academy’s 10-month prep school program provides a chance for about 240 students each year to train and study and have a chance at becoming full-fledged freshman cadets the following year. Some of those students ― who are called “cadet candidates” ― are prior enlisted, some are recruited athletes, and some are “diversity students” who come from disadvantaged backgrounds such as poor school districts. In a 2014 interview with Air Force Times, former prep school commander Col. Jerry Szybist said that some cadet candidates come to the prep school having had little experience with people from different backgrounds. Some may never have worked side-by-side with a black person or a woman. So, Szybist said, prep school leaders try to “pull them together” during the initial three weeks of basic military training as they teach them discipline, values and the foundations of a military life. The top officers of the Army, Navy, Air Force and Marine Corps have issued statements denouncing racism and extremism in the days since white supremacists marched in Charlottesville, Virginia. 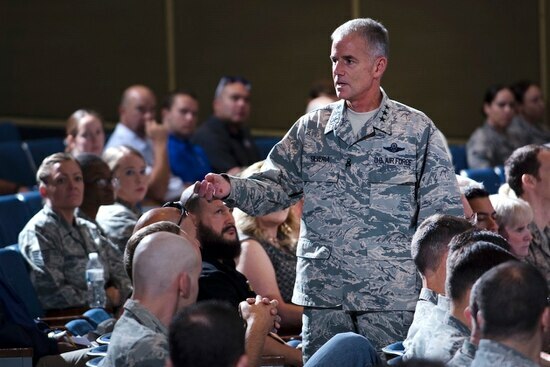 In August, days after a white supremacist rally in Charlottesville, Virginia, erupted in violence, Air Force Chief of Staff Gen. Dave Goldfein joined the other service chiefs in denouncing racism and extremism. "I stand with my fellow service chiefs in saying that we're always stronger together," Goldfein said in an Aug. 16 tweet. “It’s who we are as airmen. Integrity, service and excellence ... thats what America's Air Force is about." "The challenges that we face, some of them are wicked hard and require some really creative and thoughtful approaches," Goldfein said. "We come from all races, colors and backgrounds, and we‘re able to take this very diverse force and bring it together into a fist. It's, in fact, one of our greatest strengths." In a Wednesday email to Academy leaders ― which was posted on the Air Force amn/nco/snco Facebook page and confirmed by the academy ― Silveria said that prep school commander Col. Jackie Breeden had addressed the students and faculty of the prep school. Breeden had also reached out to the academy’s chief diversity officer to start holding small group discussions with the cadet candidates as the investigation continues. Silveria also urged academy officials not to shy away from discussing the racial slur incident. "We've all seen the ongoing controversy in the NFL and witnessed the fallout since the riots and violence in Charlottesville, and we know the conversations that are happening in our society and in social media,” Silveria wrote. “I would like us all to be engaging in these tough conversations, in a civil manner that spurs more discussion and reaches productive solutions. To that end and to be clear: do not avoid the topic. I expect you to have conversations with Cadets about respect and dignity. This discourse is how we grow and how we develop our future officers." "We don't always know what 'right' looked like for them in the families, schools and communities where they grew up," Silveria said. “But once they arrive here and get immersed in the Air Force culture, it must be absolutely clear how we look out for and respect one another. ... I want cadets to see that we take a united stand on the importance of respect and dignity as part of our Air Force way of life, and that we ― espousing a diverse variety of backgrounds, expertise and viewpoints ― are stronger together."